In 2004, the Ministry of Culture launched a competition for the Mucem Conservation and The source Centre (CCR) on the brownfield site of La belle de mai, near Saint-Charles station in Marseille. The architectural practice of Corinne Vezzoni and partners/AURA was designated winner of the competition in September 2004. The Conservation and Resource Centre, a place intended for the storage and study of the collections, occupies a plot of around 13,000 m² on 1.2 hectares of formerly military land, the Bugeaud site of the Muy barracks, in the La belle de mai district, a plot large enough for subsequent extension in a second phase. It houses all of the museum’s reserves as well as it’s documentary collections, its library and its scientific archives. The Mucem CCR carries out the museum’s primary functions, i.e. the storage, preservation, study, archiving, maintenance and development of the collections. The centre is also intended to become a lively place, a tool for the enhancement and dissemination of the collections through an active policy of loans and deposits. It will be a working tool for heritage professionals, researchers and students, providing access to all the collections and archives of the Mucem. The general public will also be able to access some of the archives, by appointment, as well as the temporary exhibitions. Bruno Suzarelli was nominated director of the Mucem in November 2009. The owner of the building is EMOC (a public cultural works establishment), which is conducting the Ministry of Culture’s first public-private partnership, with the Icade Group (a subsidiary of Caisse des dépôts et consignations) which the Ministry chose, in 2006, to finance, build and operate the structure for a period of 25 years. The La belle de mai district, characterised by the presence of brownfield sites, already hosts the City’s municipal archives, La friche de la belle de mai and the Media Centre with its studios. The Conservation Centre is the last of the amenities in this district, focused on cultural development and particularly accessible because of its proximity to the station. In installing the Mucem conservation building in a radical and compact way on the site, Corinne Vezzoni shows the maximum dimensions as an echo of the neighbouring industrial masses and the base of the artillery barracks. Its simple volume, easily identifiable even in a fleeting glimpse from a passing train, is designed to make it an urban signal but also an echo for the Civilisations Museum. 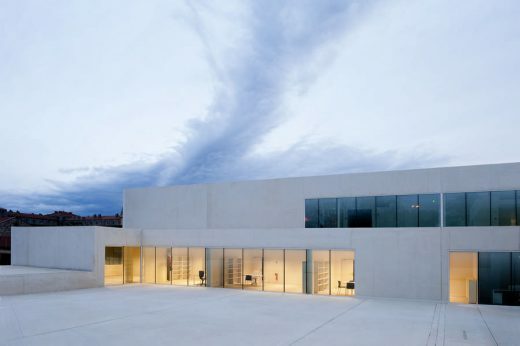 Employing exactly the same footprint as the Civilisations Museum (72 x 72 m), through a kind of sly reference, the architect has built a great monolith of rough concrete, like solid a piece of sculpted rock, to allow natural light to penetrate. The reference to the work of the Spanish sculptor Eduardo Chillida 1 is explicit. 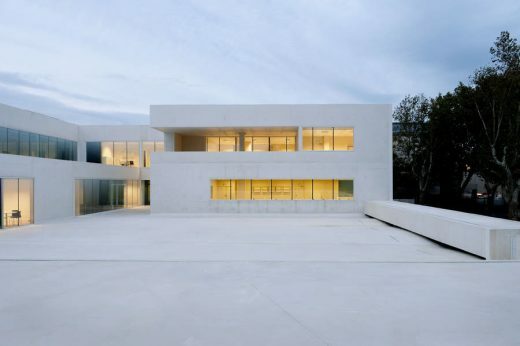 The coloured, poured concrete solid shell is thus cast and hollowed so that the brightness of a smooth and reflective white concrete emerges from the thickness of the building. Streetside, the building echoes the industrial scale of its surroundings, and maintains the alignments. Passers-by see a wall of raw concrete, ochre in colour, but this apparent opacity contrasts with the interior, which is organised around sunlit, south facing patios. An inner world takes its place in these hollows. The offices and temporary exhibition space are protected from the noises of the city, enjoying a peaceful atmosphere emanating from the heart of the site. The lines of trees have been retained and can be glimpsed from the street, above the former sheds. Pedestrian access is via the original square. Essentially housing reserves, the building is by definition turned on itself, unlike the Mucem building which represents the visible side of the institution. For the architect, “reserves are the underside of the décor; the place of secrets”. The roof, clad with large slabs of coloured concrete add to the monolithic image, and provide the view of a fifth facade from the Le Muy barracks and the railway line. In addition, two existing buildings have been retained and refurbished on the edge of the site: a warehouse on the street to house collections in transit and hut accommodation for foreign researchers. The major purpose of the Mucem CCR is to preserve the museum’s collections, hence the need for the reserves to maintain the right temperature and moisture levels for the items stored. This requirement is met by some fifty air treatment plants and coolers installed on the building’s entresol, with output of 12,000 m³ per hour. There is no sign of the complexity of these facilities and air networks, which each supply reserves set aside for specific collections, maintaining the building’s monolithic architectural appearance both in the walls and roof. The CCR houses more than 7000 m² of modern reserves, laid out on three floors, under the appropriate preventative preservation standards (temperature and moisture). These reserves are partitioned to match the size and weight of the collections,with structures capable of an operating load of 1.5 tonnes per square metre. Four small so-called “low-temperature” reserves are provided to house the most sensitive objects. Near the entrance to the reserves, the delivery area combines with areas for manoeuvring and handling the objects: packing/unpacking, quarantine room, equipment storage premises, preparation of objects for exhibitions, etc. An oxygen-free chamber is also provided for potentially infested objects. A paper assembly workshop with the capacity to handle this type of structure complete the layout, together with a restoration workshop and a big photographic workshop. Apart from the handling and storage of the collections, the CCR has appropriate spaces for storing documentary collections and scientific archives, as well as a library to support research and a temporary exhibition premises. The programme’s innovation lies in the building’s capacity to open its reserves to the public (tours by appointment). The CCR is the first cultural amenity built and financed under the public-private partnership procedure (PPP). The cost of the building is 15 million Euros. The Ministry of Culture approached Icade, a real estate operator and subsidiary of Caisse des dépôts et consignations, for this partnership, the terms of which resemble a 25 year leasing arrangement, in which Icade is responsible for financing, building and maintaining the building and the Government pays an annual fee or rent for the period of the contract. At the end of this partnership contract, the State recovers full ownership of the building. In January 2000, Corinne Vezzoni and Pascal Laporte, who had worked together since the 1990s, created Corinne Vezzoni et associés (architecture firm), located at La cité radieuse. In 2007, Maxime Claude, a member of the team since the beginning, became a partner. Born in 1963, Corinne Vezzoni is a graduate of the Marseille School of Architecture where she came to study in 1987 after a childhood spent in Morocco. Corinne Vezzoni works as a teacher, in particular as a lecturer at the Université de Provence (Masters in development and planning), as a guest lecturer at École polytechnique de Marseille Château-Gombert and at the Marseille-Luminy School of Architecture. Abroad, she was a Visiting Teacher as part of the Sienna ILAUD in 1998 and for international events at the Venice Biennale in 2006 and 2008. Corinne Vezzoni works in consultancy (for the Bouchesdu- Rhône CAUE from 1998 to 2002) and in ideas through the CESR’s “perspective et développement” committee, on which she is a guest member for the period 2009-2014. She sits on many competition juries. She has been a member of the Academy of Architecture since 2011.